On Wednesday, November 14, 2018, Neil Varon, conductor, and The Eastman Philharmonia present Mahler’s Symphony No. 6 at 7:30 p.m. in Kodak Hall. Mahler’s Sixth Symphony is a fantastical work that is thought to draw on elements of his life. As a result, Mahler may have subtitled it“Tragic” at some point during the compositional process. A notoriously famous element of this piece is the very literal “hammer-blows” of the final movement, where the audience can witness a giant sledge-hammer come crashing down onto a large wooden box. When Mahler revised the work in 1906, he deleted the third hammer-blow, supposedly to avoid jinxing his own fate. This unfortunately proved in vain, for besides the death of his daughter the following year and the diagnoses of his fatal heart condition, Mahler also lost his prestigious job with the Vienna State Opera. The hammer that will be used in the Eastman Philharmonia performance has come all the way from Duke University, and the box was made by Eastman’s very own Percussion Technician, Brian Stotz. A rather puzzling conundrum surrounding the performance practice of this piece is the order in which to place the movements. There is always some controversy around whether the scherzo or slow movement should come second. The piece was initially published in the Scherzo-Andante order, but when first performed with Mahler himself conducting, it was performed in the Andante-Scherzo order. After the work had already been published, Mahler convinced his publisher to insert an error notice into every copy of the first edition to ensure that the work would be played in his preferred order. All this has led to somewhat of a “choose-your-own-adventure” performance practice, in which conductors decide for themselves which order best suits the journey of this piece best. Maestro Varon also noted that the famous Dutch conductor Willem Mengelberg had also said that Mahler never specified any other spot for the andante other than the second slot, and Mengelberg was one of Mahler’s closest compatriots. The Eastman Philharmonia performance of Mahler’s Sixth Symphony will be followed by a three-day residency by Maestro David Zinman. 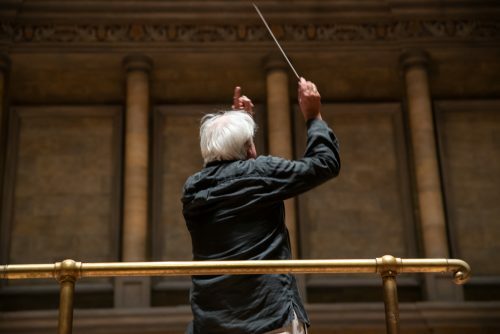 This also includes a two-day master class focusing on the symphony, and will be attended by six young conductors chosen from a large pool of applicants. These young conductors will have the opportunity to conduct Eastman’s premiere orchestra: Eastman Philharmonia. Participants include William Kelley (Lucerne, Switzerland), John Lidfors (Bochum, Germany), Tristan Rais-Sherman (Brooklyn, NY), Sam Weller (Sydney, Australia), Trevor Wilson (Ottawa, Ontario, Canada), and Shun Yao (Cleveland, Ohio). 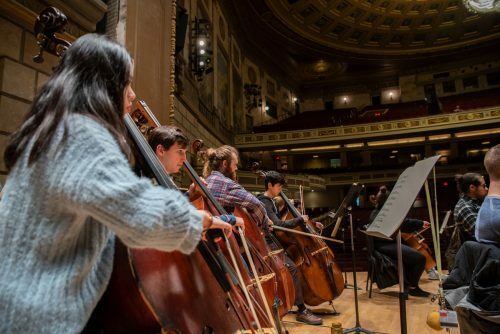 This also gives Eastman Philharmonia players the opportunity to work with Maestro Zinman in advance of their big performance of Bruch’s beloved Violin Concerto No.1 with superstar violinist Joshua Bell, along with Schumann’s Second Symphony, under the direction of Maestro Zinman on April 12, 2019 in Kodak Hall. The performance of Mahler 6 on Wednesday, November 14, 2018 is free and open to the public. on April 12, 2019 are available online at EastmanTheatre.org, in person at the Eastman Theatre Box Office (433 East Main St.), or by calling (585) 274-3000.